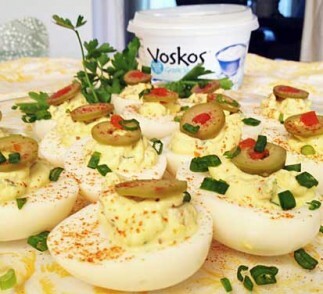 Great for packed lunches, after-school snacks or on top of a salad, these deviled eggs made with VOSKOS® Plain Greek Yogurt are savory and delicious. Eating healthy isn’t hard at all when you can have yummy deviled eggs in a snap. Halve the hardboiled eggs, place the egg whites on a platter and the yokes in a mixing bowl. Using a fork, mash the egg yokes' until finely crumbled. 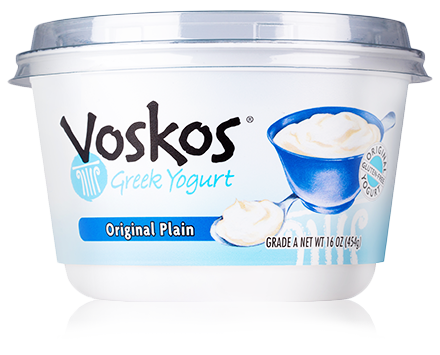 Add the Voskos Greek yogurt, chives, chopped olives, salt and pepper and a dash of garlic powder, mix until well combined. Use a piping bag or zip-lock bag, spoon mixture into bag and pipe onto egg whites. Garnish with a thin slice of green olive, sprinkle of chives and a dash of cayenne pepper.